Master the art of winning 50 v 50 matches! Fortnite Battle Royale Hacks: Surviving and Winning 50 v 50 Matches focuses on this wildly popular game play mode and arms you with hundreds of tips and strategies that’ll help improve your gaming skills and survive longer during each match. Using full-color screenshots and easy-to-understand information, this unofficial guide will quickly become an indispensable, must-have resource for anyone looking to come out victorious in any type of 50 v 50 match. 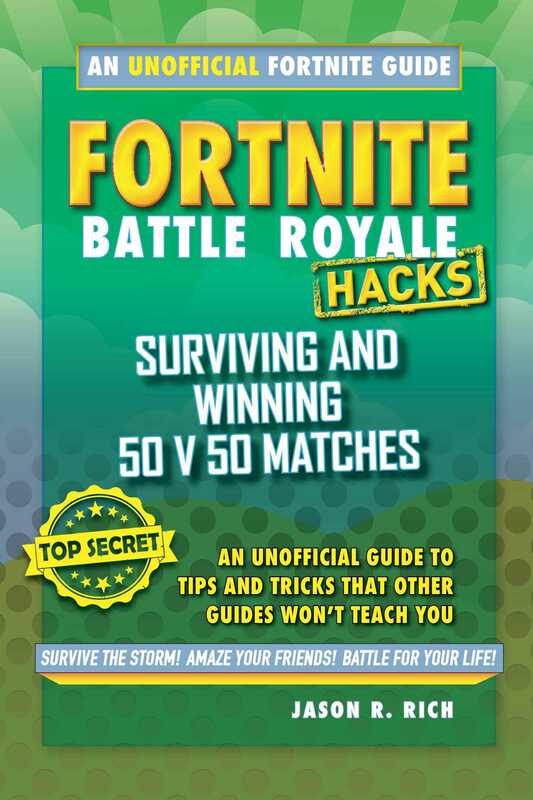 Fortnite Battle Royale Hacks: Surviving and Winning 50 v 50 Matches introduces new players (noobs) to the core game-related concepts and strategies, while providing more advanced players with added knowledge and more survival and fighting tips. "2018's first real gaming phenomenon. It's kind of extraordinary to watch. . . . It's not hard to see why gamers everywhere (and of all ages) are more than a little obsessed with it." "Addictive gameplay and visceral excitement." "Quickly exploded, conquering the Battle Royale genre . . . Nothing quite sums up 2018 on the internet quite like Fortnite. It’s highly addictive." "The biggest game on the internet." "A worldwide phenomenon.Fortnite clips and highlights have inundated Instagram, Reddit, and Twitter at an alarmingly high rate, helping it permeate mainstream culture." "The biggest game in the world . . . The top of teenagers' most wanted games list." "Fortnite continues to dominate the Battle Royale genre." "The video game taking over the world." "Already racked up a staggering 40 million players since it debuted in the fall, with 10 million joining in the first two weeks." "The game's rise thanks to its Battle Royale mode is exceptional." "Fortnite Battle Royale is on top of the world. Not only is Epic's battle royale game the most-watched game on Twitch, but it displaced 2017's big ticket game PlayerUnknown's Battlegrounds, a game that spent the better part of last year dominating the video game industry." "No signs of the game slowing down." "For a new game mode to be so rapidly developed while differing so much from the game's original vision, and to overshadow the original mode to this degree, is unprecedented."